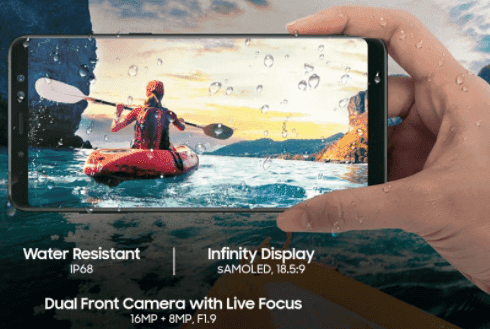 Samsung has launched its first dual-front camera smartphone named Galaxy A8+ in India. The device will be available exclusively on Amazon India from January 20, 2018. Talking about the features of the phone, the phone has an Infinity display and it has an IP68 rating for waterproof and dustproof. The phone has a 6 inch full HD Plus Super AMOLED display. It runs on Android Nougat 7.1.1 and is powered by an Octa Core Processor. The Galaxy A8+ comes with a 6GB RAM and 64GB storage which can be increased to 256GB. This phone also has a dual selfie camera with a 16 megapixel and another 8 megapixels. The rear camera is 16 megapixels. There is a Bokeh effect in the camera, with the help of which you can blur the background of the photo. The phone has 3500mAh battery. The phone costs Rs.32,990. In addition, the phone has 4G LTE, Wi-Fi 802.11ac, Bluetooth v5.0, GPS / A-GPS, NFC and USB Type C.